The Vincennes’ downing of Iran Air Flight 655: The United States tried to cover up its own destruction of a passenger plane. The time the United States blew up a passenger plane—and tried to cover it up. 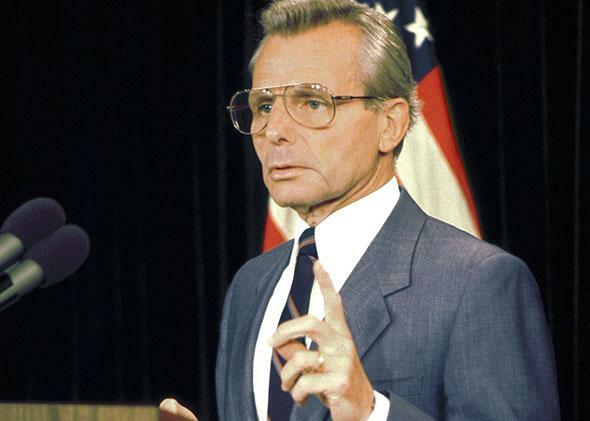 Secretary of Defense Frank Carlucci answers questions from the press regarding the downing of Iran Air Flight 655 at the Pentagon on Aug. 19, 1988. Fury and frustration still mount over the downing of Malaysia Airlines Flight 17, and justly so. But before accusing Russian President Vladimir Putin of war crimes or dismissing the entire episode as a tragic fluke, it’s worth looking back at another doomed passenger plane—Iran Air Flight 655—shot down on July 3, 1988, not by some scruffy rebel on contested soil but by a U.S. Navy captain in command of an Aegis-class cruiser called the Vincennes. In several ways, the two calamities are similar. The Malaysian Boeing 777 wandered into a messy civil war in eastern Ukraine, near the Russian border; the Iranian Airbus A300 wandered into a naval skirmish—one of many clashes in the ongoing “Tanker War” (another forgotten conflict)—in the Strait of Hormuz. The likely pro-Russia rebel thought that he was shooting at a Ukrainian military-transport plane; the U.S. Navy captain, Will Rogers III, mistook the Airbus for an F-14 fighter jet. The Russian SA-11 surface-to-air missile that downed the Malaysian plane killed 298 passengers, including 80 children; the American SM-2 surface-to-air missile that downed the Iranian plane killed 290 passengers, including 66 children. After last week’s incident, Russian officials told various lies to cover up their culpability and blamed the Ukrainian government; after the 1988 incident, American officials told various lies and blamed the Iranian pilot. Not until eight years later did the U.S. government compensate the victims’ families, and even then expressed “deep regret,” not an apology. The USS Vincennes returns from deployment on Oct. 24, 1988, just months after shooting down Iran Air Flight 655 over the Strait of Hormuz. As the Boston Globe’s defense correspondent at the time, I reported on the Vincennes shoot-down, and I have gone back over my clips, chronicling the official lies and misstatements as they unraveled. Here’s the truly dismaying part of the story. On Aug. 19, 1988, nearly seven weeks after the event, the Pentagon issued a 53-page report on the incident. Though the text didn’t say so directly, it found that nearly all the initial details about the shoot-down—the “facts” that senior officials cited to put all the blame on Iran Air’s pilot—were wrong. And yet the August report still concluded that the captain and all the other Vincennes officers acted properly. For example, on July 3, at the first Pentagon press conference on the incident, Adm. William Crowe, chairman of the Joint Chiefs of Staff, said that the Iranian plane had been flying at 9,000 feet and descending at a “high speed” of 450 knots, “headed directly” for the Vincennes. In fact, however, the Aug. 19 report—written by Rear Adm. William Fogarty of U.S. Central Command—concluded (from computer tapes found inside the ship’s combat information center) that the plane was “ascending through 12,000 feet” at the much slower speed of 380 knots. “At no time” did the Airbus “actually descend in altitude,” the report stated. There were other equally disturbing discrepancies between Crowe’s July 3 press conference (which struck me as suspicious even at the time) and Fogarty’s Aug. 19 report. Crowe had said the plane was flying “outside the prescribed commercial air route”; the report said it was flying “within the established air route.” Crowe had said the plane’s transponder was “squawking” a code over the “Mode 2” military channel; the report stated that it was squawking over the “Mode 3” civilian channel. Crowe had said the Vincennes issued several warnings; the report confirmed this, but noted, “Due to heavy pilot workload during take-off and climb-out, and the requirement to communicate with” two air traffic control centers, the pilot “probably was not monitoring” the international air-distress channel. 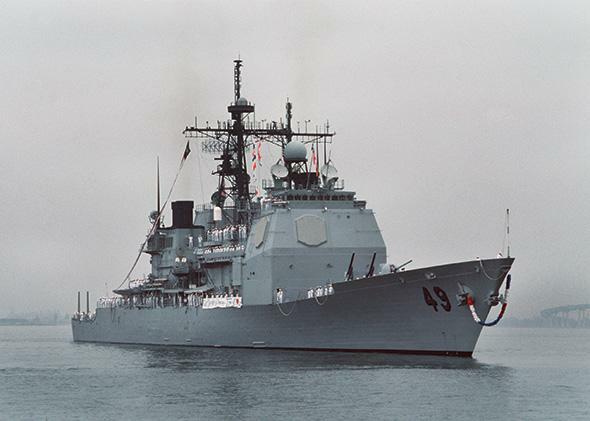 One more shocking bit, which I didn’t know until just now: In 1992, four years after the event (and shortly after I moved on to a different beat), Adm. Crowe admitted on ABC’s Nightline that the Vincennes was in Iranian waters at the time it shot down the plane. Back in 1988, he and others had said that the ship was in international waters. It also came out that some other Navy officers had regarded Rogers as “aggressive” and found it strange that he was moving his Aegis cruiser into those waters to pursue Iranian patrol boats—overkill at best, asking for trouble in any case. The distractions of the chase, possibly combined with the fact that the Aegis radar-guided missile system was new at the time, may have led to his fatal misjudgment. Finally, in 1996, President Bill Clinton’s administration expressed “deep regret” and paid the Iranian government $131.8 million in compensation, of which $61.8 million would go to the victims’ families. In exchange, Tehran agreed to drop its case against the United States in the International Court of Justice. Many Iranians continued to believe, for many years, that the shoot-down was deliberate. They found it hard to believe that the United States Navy, with its polish and dazzle, could have committed such a ghastly deed by mistake. And they were ready to believe that America—“the Great Satan,” after all—was capable of such evil. None of this is meant to let Putin off the hook for whipping up secessionists in eastern Ukraine, giving them advanced weaponry, and training them how to use it. Nor do I mean to draw false equivalencies between Russia in Ukraine today and America in the Persian Gulf a quarter-century ago. That said, the Vincennes saga is more than a mere shocking bit of forgotten history. There are parallels between then and now, lessons to be learned. First, things like this happen when the zones of war and normal life intersect. Best to avoid mingling the two or, if it can’t be helped, to hold the reins tight, as they slip out of control too easily. More than this, it’s best to own up to horrible mistakes. America might have come away with a better image, at a crucial moment in Middle East conflicts, if President Reagan or George H.W. Bush had quickly acknowledged what was clear to several senior officers, admitted blame, and compensated the victims. Russia would do better if Putin did so now. Image isn’t everything; there are still policy disputes to be had. But to engage in such transparent deception only creates or confirms an impression of mendacity or evil. Putin and whoever fired that missile should be held accountable, just as Reagan and the crewmen of the Vincennes should have been, even if they weren’t. But holding them accountable, meting out proper punishment, doesn’t mean tagging them as terrorists or war criminals. First, there’s a distinction between ghastly mistakes of war and monstrous acts of terrorism. Second, the West’s main interest in Ukraine is—or should be—to help facilitate a peaceful, prosperous Ukraine. The secessionist fever, which Putin whipped up, sowed the climate—crossed the zones of war and normal life—that made something like the Malaysia Airlines Flight 17 tragedy possible. It may be a good moment now to change the climate. But that requires realism on all sides, not indulgent theatrics or the forgetting of history.